I sure haven’t done one of these in a while. I need to write about these, uh, two dozen different Japanese Kit-Kat flavor variants I’ve stored up before they go bad. So let’s talk about this one: Yubari Melon, a regional exclusive flavor from Hokkaido. I don’t know Japan super well, but my impression is that Hokkaido is one of those antipodes areas where people are more likely to visit than live. I assume this is why the box these mini candy bars come in has been designed to be mailed: The back of the box resembles a post card, though I doubt you can ship half a dozen chocolate bars for standard postcard rate even in a crazy Future Land like Japan. 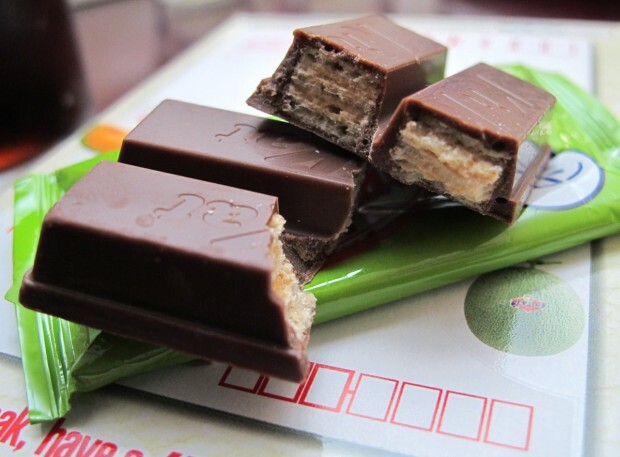 These Kit-Kats, like so many from Japan, are hit-or-miss. My wife was unimpressed with the flavor, because melon and dark chocolate aren’t a good combo for her. On the other hand, I love chocolate and melon, although I prefer actual melon as opposed to artificial melon flavor. Then again, if this were real fruit, it would have gone pretty rancid in the 18 months I’ve had this box sitting around waiting for evaluation. I think a lot of my like for this particular flavor stems from the fact that I expected a melon Kit-Kat to be some kind of nasty, heavily perfumed white chocolate abomination. Since it combines the fruit flavor with rich dark chocolate instead of white chocolate, it’s delicious rather than tooth-achingly sweet. Well done, Hokkaido. If I ever visit you, I will totally mail these things to everyone I know while I’m there. Well, everyone except my wife. This entry was posted in Kit-Kat Densetsu and tagged chocolate, japan, kit kat. Bookmark the permalink. One of my happy discoveries during my first trip to Japan (which sadly was no longer in evidence on my second) was green melon milkshakes at McDonald’s. Quit tasty, and pretty much the only reason to set foot in a Japanese McDonald’s. Or possibly any McDonald’s. What about shamrock shakes? They look like Irish Spring soap and taste like it, too! There’s a really tasty melon soda you can buy only in Japan. A bunch of my friends in the gaming press are bonkers for it. I can confirm that that melon soda exists, and is the most shockingly unnatural shade of green. It looks like mutagen ooze, but does taste delightful, and is sweet enough to send one into a coma almost immediately. You can sometimes find the melon soda around here… well, if you’re referring to Ramune soda, that ism with the little glass ball stopper thing. I can find them in Asian grocery stores, which I visit every so often, and in chain stores like World Market (uh, yeah). After reading about these wacky Kit-Kat flavors on this blog, I had to hunt them down when I visited Japan at Christmas. But… I couldn’t find many. Normal, dark chocolate, strawberry (or maybe cheesecake or something) were the most common. Finally found a lot at the airport… gave melon and apple a try. Not the same melon, though, I think – pretty sure this wasn’t dark chocolate. In fact, it was the exact thing you’re talking about – light-green colored white chocolate. As a novelty, it was fine, not being a Kit-Kat connoisseur like yourself. The apple… well, if I recall, it used milk chocolate, and had a much more subtle flavor. Unfortunately, though apple is my favorite fruit, I don’t think the flavors matched up very well. Nah, the melon soda isn’t Ramune. It’s just your typical soda with no fancy marble technology. Kind of reminds me that one toxic green Faygo… Frosh, I think? But way better. That would be Frosh. I have never quite understood the appeal of that particular flavor. But who am I to question anyone’s pop choices as I drink Vernors. Non-native Michigan residents have been known to call it swamp water. I demand a review of a soy-sauce flavored Kit Kat. I know they are out there! What a weird and wonderful blog this is. Soy Sauce Kit-Kats are gross and I will not review them again. I’ve already done it once, and that was one time too many.